"Starting in July 2010, my team communicated consistent and serious interest to John Hancock's elite athlete coordinator about my competing in the 2011 Boston Marathon. Unfortunately, though John Hancock's representative indicated there was a lot of interest in having me as part of the field and keeping the conversation alive until late January, no offer was made. It's not that I'm not getting what I want, it's that John Hancock did not make me an offer at all." - Excerpt from a statement Meb Keflezighi made on his website expressing his disappointment at not getting an offer to run the 2011 Boston Marathon. Cycling to treat Runner's Knee? *Full John Hancock Release Reigning champs Robert Kiprono Cheruivot & Teyba Erkesso will defend their titles. Stephanie Hightower's State Of The Sport Address We are glad to see Steve Miller in charge of the Search Committee for the next USATF CEO. We haven't heard much about him, but what we have heard has always been positive. Ken Goes Says USATF Needs To Think Of Its Fans So true. *Boston Globe Recap: Brown Gets Surprising Win; Verzbicas Says He Was Nervous LV says he's not normally nervous for races. A Must Read Boston Globe Introduces Lukas Verzbicas To The World A great profile that is definitely worth the read. Verzbicas talks about moving to the US 10 years ago and how his dreams have become a reality since then. Irish Junior Stud Darren McBrearty Runs 1:47.87 Indoors In Vienna His PR has come down 1.5 seconds in a week. Over the weekend, he actually lost to another Irish junior, Mark English, as they both went sub-1:49. LRC Preview Bernard Lagat To Go For US Two-Mile Record On February 12th At The Armory It's worth noting that Doug Padilla didn't even know he still had the record (8:15.02). It's also worth noting that Robby Andrews is expected to rabbit, so it looks like he's rebounding from his plantar injury. Fastest 1,500m Runner Of 2010, Silas Kiplagat, To Race Reigning World Indoor 1,500m Champion Derese Mekonnen At Birmingham On Feb. 19th Mekonnen is fresh off his victory over Bernard Lagat at the Wanamaker Mile and Silas Kiplagat (3:29.27 1,500 last year) just recently said he thinks he's in shape to break El Guerrouj's 1,500 World Record, so this should be a great matchup. Thomas Dold Sets Record For 6th Straight Win In Empire State Building Run-Up He ran up 86 flights of stairs in 10 minutes and 10 seconds. IAAF Profiles World High Jump Champ Blanka Vlašić She'll be 29 in 2012 and still doesn't have Olympic gold. IAAF Profiles 800 World Record Holder David Rudisha Did you know his dad has two wives? Houston: Bekana Daba Nearly Goes Sub-2:07, Strong Day For Americans Daba, a 12:58 5ker on the track last year, had the credentials, but his first marathon wasn't great (2:14 in Amsterdam). He put that behind him, running a stunning 1:02:47 on the second half of the course to finish in 2:07:04 despite a bathroom break near the finish. American marathoning is definitely on the upswing; at the fast halfway split, there were 2 Americans in the pack (Nick Arciniaga and Brett Gotcher). Arciniaga would grab second and a 2:11:30 PR. Last year's surprise Gotcher blew up. On the distaff side, Mamitu Daska of Ethiopia prevailed in a duel with Ashu Kasim, as American Stephanie Rothstein surprised with a huge 10-minute PR and sub-2:30 clocking. *Nice Recap From Houston Chronicle No wonder Gotcher blew up; the lead pack did a 4:29 mile for mile 14 (which is Gotcher's 10k PR pace and way faster than Nick Arciniaga's 10k pace) and then 3 sub-4:40 miles from 16-18. *RRW: Americans Nick Arciniaga, Stephanie Rothstein Impress Nick was only slated to pace Gotcher through 25k, but he was open to the idea of finishing. US's David Oliver Beats European Champ Andy Turner In The 60m Hurdles Turner was trying to "scalp" Oliver (read here), but Oliver beat him easily. Maybe Turner should stick to soccer. Russia's Ivan Ukhov Just Misses World Record In High Jump Check out a video of his jump here. It looks like he's jumping in a big barn. Ukhov is a stud but is most known for being the guy jumping drunk at a meet in 2008. The Olympics Are Over A Year Away, But The UK Is Already Trying To Count How Many Medals They'll Win Their goal is 10. 400m Runner Shana Cox May Be Left Without A Nation To Run For Cox is switching nationalities from the US to Great Britain and plans to run on the GB 4 x 4, but her clearance might not come through in time for the World Championships in August. London Stadium News - The Olympic Track Will Stay? West Ham To Be Announced As Winner Over Tottenham In Olympic Stadium Battle On Friday In case you haven't been paying attention, they are the ones that want to keep the track in the stadium. Tottenham Claims That Olympic Stadium Announcement Was "Premature"
Third All-Time UK Shot Putter Mark Edwards Suspended For Failing Doping Test The 36-year-old had been one of the UK's top shot putters for more than a decade, throwing 18-19 meters for years before setting a one-meter PR in 2008 with a throw of 20.88m. 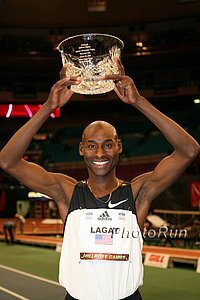 Runners World: A Brief Chat With Bernard Lagat After two-mile record, he wants to get the 5k "A" standard out of the way in Australia. Alan Culpepper Still Running Races Behind The Scenes - Working For Rock 'N Roll People On retirement: "It's a profession that you just can't keep going in," he said. "Eventually, abruptly, you start getting worse. It's not a pretty exodus. You have to come to terms with it. I'm thankful that I can still be in the sport in this fashion and be around like-minded people." Dayron Robles, David Oliver And Andy Turner To Race In 2 Weeks In UK Robles and Oliver are racing this week. Menjo Wins San Sebastián XC Meet LRC favorite Josephat Kiprono Menjo won over a field including European champion Sergiy Lebid (3rd) and the world indoor 3,000m silver medallist Sergio Sánchez (7th). 2005 World Cross-Country Silver Medallist (Short Course) Abraham Chebii Wins Discover Kenya Half Marathon Chebii won with a 1:02:59 in his debut half marathon at altitude. Athletics Kenya Is Forcing Two Time World Marathon Champ Catherine Ndereba To Run Worlds In 2011 Should we predict a convenient DNF? Oregon's Brianne Theisen Breaks NCAA Pentathlon Record* Theisen broke the previous NCAA record (4,496 points) by 11 points. She needed a 2:15 in the 800 and she ran 2:14.5. Afterwards, she said, "It's pretty cool, but I'm pretty tired." *But Her Record Probably Will NOT COUNT No, she didn't run out of her lane. But she did run on an oversized track. Indiana's Madness Continues As Three Hoosiers Break 14:00!!! If that's not enough, Andy Bayer followed up his 7:48 with a 3:57. NCAA XC Champ Sheila Reid Of Villanova Breaks Amory 3k Record With 8:56 Jordan Hasay also ran 9:05 at UW. Breakthrough Of Decade? Woman Whose PR Was 5:38 3 Years Ago Runs 4:33 Mile And Beats Shalane Flanagan Check out Lauren Johnson's amazing background here. 3 Break Four At Penn State, Led By Cory Leslie's 3:57.97 It was Leslie's 1st time under 4:00. PSU's Ryan Foster also busted 4:00. Also at the meet: Cas Loxsom of PSU 1:47.36.